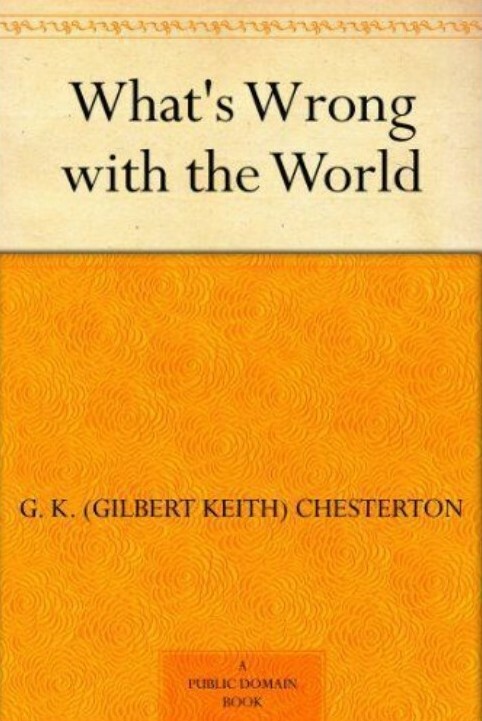 I recently read G. K. Chesterton’s What’s Wrong with the World. He wrote this book in 1900. Although some of the later segments are not directed toward questions that are not under consideration today (for example: Why would women want the vote? ), the very first part, the part that gave rise to the title, I found very helpful in guiding my thinking and proved very relevant to the questions that seem to confront me at every turn. His discussion focuses on mistakes made by those who advocate for some the elimination of a perceived ill through social change. Chesterton begins by pointing out that those who advocate for some social change explicitly or implicitly use the metaphor of a physician treating a disease. This is a false assumption because in disease we all know what health looks like and so the only dispute is about the nature of the disease and the proper treatment to return the individual to health. But social science is by no means always content with the normal human soul; it has all sorts of fancy souls for sale. Man as a social idealist will say “I am tired of being a Puritan; I want to be a Pagan,” or “Beyond this dark probation of Individualism I see the shining paradise of Collectivism.” Now in bodily ills there is none of this difference about the ultimate ideal. The patient may or may not want quinine; but he certainly wants health. Chesterton, G. K. (Gilbert Keith). What’s Wrong with the World (p. 3). Kindle Edition. The social case is exactly the opposite of the medical case. We do not disagree, like doctors, about the precise nature of the illness, while agreeing about the nature of health. On the contrary, we all agree that England is unhealthy, but half of us would not look at her in what the other half would call blooming health. I think Chesterton would say the first step in this discussion would be to talk about our private ideal of social health and defend why everyone should want to get there. We might agree that the current situation is bad, but that doesn’t mean the proposed change won’t make things worse. The only way to discuss the social evil is to get at once to the social ideal. We can all see the national madness; but what is national sanity? I have called this book “What Is Wrong with the World?” and the upshot of the title can be easily and clearly stated. What is wrong is that we do not ask what is right. Chesterton, G. K. (Gilbert Keith). What’s Wrong with the World (pp. 3-4). Kindle Edition. If I applied this proposed solution what would our society look like? Would our freedoms be enhanced? Would I still be able to speak freely and follow my convictions? Would my freedom to choose what I think is best for myself, my family, and community be unimpaired? Would there truly be equality of opportunity? Would competence be recognized and rewarded? Is the proposed solution tyrannical or draconian? Would I be setting up a new kind of oppression? Am I restricting people’s employment or their ability to go into business for themselves? Does the solution implementation consist of convincing people by argument and example that the new proposal is a better way to a worthy end or am I legislating and punishing to get there? These two clusters of questions have been most helpful in thinking about these social remedies that I see on Twitter, Facebook, in the news, or spoken about over coffee. They also help me as a science fiction writer. As I write my novels I am often confronted with painting, using words, a future world. One way to get the painting right would be to use the Chesterton questions to extrapolate into the future. If I do that, I can often see how these questions illuminate the difficulties in the proposals and lead to dysfunction and unintended consequences. If you have any thoughts on this, I would appreciate hearing from you. Peter Kazmaier is the author of the science fiction series, THE HALCYON CYCLE. His books can be found on Amazon, Chapter/Indigo, iBooks, Google Play, and at your local library through Overdrive. I recently had a conversation with a friend at my cottage about one of the injustices that occurred in our past in Canada and the inevitable question came up: “What do we do about it now?” As various potential answers to this question were proposed, they seemed unsatisfactory. Indee d often they seem to propose a new injustice visited on people who were, of course, not alive one hundred or two hundred years ago to redress wrongs in which they had no direct part. I was just reading G. K. Chesterton’s What’s Wrong with the World at the time, and it struck how illuminating and helpful his work was for enabling me personally sort through this puzzle of separating good solutions from bad ones. Chesterton made the point that so often when we try to fix what is wrong with the world, we pay insufficient attention to defining what the ideal is or should be (the picture of flower reminds me of an ideal). He uses the metaphor of a medical doctor. If a doctor is to heal a patient, he has to have an accurate notion of what a healthy person looks like. If he just focuses on defects or things that are wrong, then the remedial action may actually make things worse rather than better for the patient. To use an extreme example to make a point, a doctor distressed by the lack symmetry in a one legged patient, may decide to restore the symmetry by removing the other leg, rather than enabling some walking capability by providing the patient with a prosthetic. Similarly for the injustices in our past that face us now, I need to ask “What kind of society do I want to live in? What would make it fair and just? For me, asking this question, removes from consideration many options which simply implement new injustices to make up for old ones. If you haven’t read Chesterton’s What’s Wrong with the World, I suggest you give it a try. I think it was first published in 1910 (some say 1900 but I think that’s too early since Chesterton first began writing books in 1900) yet it seems prophetic and anticipates so many questions facing us today.